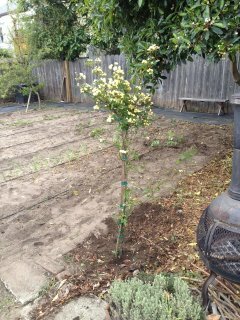 Tree planted, (see below) - Alameda, San Francisco Bay Area where I started my mainland American poeticjourney visiting my friends and promoting Trees for Travel. I bought this lovely yellow tea rose climber for Adam Gillitt, (of http://www.gillico.com/) on a rainy day, the last day I was there. Just around the corner it was, at their local shops. We had the whole garden centre to ourselves. Yes, a tree bought and planted at last. This fine speciman, below shall grow into an enormous climber. Over an archway perhaps Adam? It is a symbol of renewal in a garden, an archway. I have one in mine. If anyone at home in NZ btw would like a tree in their garden, I'd love to plant one 'for' the people who turned down my offer of a tree, these fine friends met online most of them 12 years ago, in America. Strange, maybe offering to plant a tree for folk is really odd here? So anyway, if any of you who I know in NZ want a fruit tree or other specimen let me know, then I will get it planted and in my mind dedicate each one to a place here in the States, where I stayed. If you like I can tell you where that place was, I have some fine stories to tell believe me. Then we can have lunch or dinner, and enjoy a day or afternoon sometime? This is an art project, it is all being documented and will feature in a book eventually which will be sold. This in turn should encourage others to plant trees for travel. I love the idea we are growing good things together, in some way. I will also be buying trees for South Australia to cover the carbon for this trip. They need them. Go ahead and buy some yourself, it's a lovely way to keep the world good and healthy. The tree to the side of this blog, click on that and it goes to a google search re Trees for Travel, choose one or just plant trees locally with proper care and attention. Awww, lookit thaaat. Sweet. Great job Adam did with his friends Tom and Giselle.